Consumers are increasingly turning to brands without heritage or history. Why? For ‘heritage’ and ‘history’, read ‘tired’ and ‘tainted’ as brands are exposed for unsavoury business practice, avarice, tax avoidance and a host of other failings in consumers’ eyes. In the developed world, trust in big brands is on the wane, trust in established brands still registers in the developing world but is being challenged there too. The profound shift wrought by technology adds a new dimension – think internet, mobile, self-publishing, 3D printing … disruption, as the barriers to entering a marketplace are lowered. Our new luxury is guilt-free consumption. Brands which make us ‘feel good’ will win our money – and this goes beyond ‘greenwash’. Remember, almost 65% of UK consumers think most companies are trying to be responsible only to improve their image and 91% couldn’t care less if established brands disappeared. As people we like to be seen as ‘good’. Our desire to be ‘good’ – an idealistic state perhaps – is thwarted by pockets that aren’t as deep as they once might have been or is subject to change by aggressive marketing … the must haves from tablet to clothes which might be made with little regard for the people who made them or environmental cost … and each time we purchase these we compromise our desire to be ‘good’, trading in for features and functionality we are made to believe will make our lives better. Yet, we see the effects of dysfunctional business processes and ethics, hear the voices of workers from developing countries, or assimilate scientific insights on the health impact of processed foods – everywhere. Absolution comes in the form of brands which shout about not employing 9 year old child workers in Bangladesh, not force-feeding poultry, whose products do not depend on fossil fuels. Our doubt about those brands which keep quiet grows – hello Method, not so sure about P&G or Unilever? Look at the recent news about Marks & Spencer’s declining sales versus John Lewis and Waitrose’s soaring sales – the former started talking about ethics a couple of years ago, the latter two were founded on ethical, co-operative principles and remain so and despite not being the cheapest offering on the high street, win the race for quality by a country mile. Some say the solution for established brands is to continue investing in talent and product development and partner with new ‘non-toxic’ brands. I’m not so sure. The strength and appeal of new brands springs from their independence and ‘clean’ credentials. 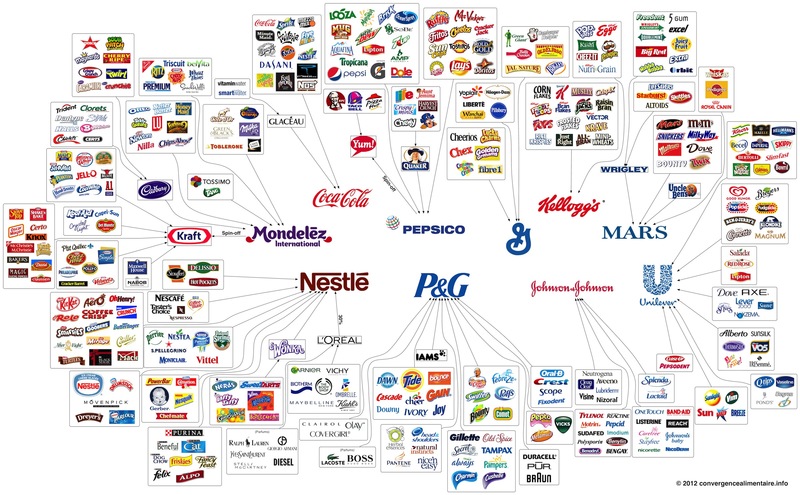 As this infographic shows from 2011 shows, we are informed consumers. We know who owns what, and if we don’t like it, we won’t buy it. Simple.